A friend just sent me this story and I had to share. CALGARY - He was born in less than auspicious circumstances -- his life saved by an RCMP officer who, in the middle of the night, cut him loose from his umbilical cord after his mother was killed on a rural highway. 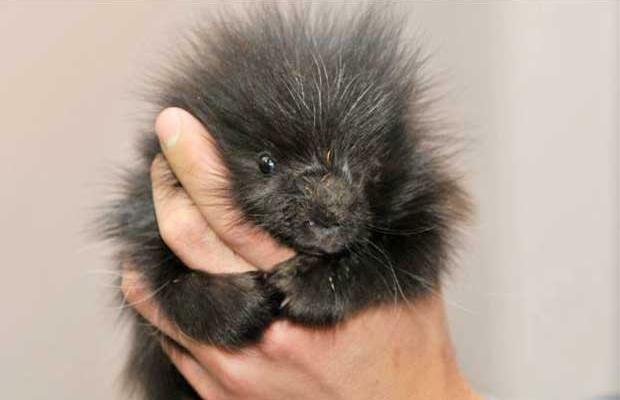 One-month-old Charlie the porcupine has recovered well from his miraculous birth and is now melting hearts at the Medicine River Wildlife Centre, where he lives. He almost didn't make it. His survival comes thanks to RCMP Const. Charles Lambright, who struck and killed the little porcupine's mother after he was faced with a set of oncoming headlights toward the end of his shift near Rimbey a month ago. As Lambright dragged the porcupine carcass off the road, he noticed something moving. That's when he discovered little Charlie, still alive, but connected to his mother by the umbilical cord. "I just wanted him to live," Lambright said in an interview Tuesday. Cutting the little guy loose, the officer wrapped him in a towel and placed the porcupine on the floor of his cruiser while he finished his shift. For 24 hours, Lambright and his wife cared for Charlie at their home as they searched for an organization to take him. That's when they found the wildlife centre. "After a while doing a job like this, you pull for whatever you can do," Lambright said, explaining why he saved and cared for the porcupine. Lambright called the little critter Highway 20 after the route he was born on. But staff at the wildlife centre named him after the Mountie who saved him, hence Charlie. These days, Charlie is being weaned off formula and is eating carrots, squash and apples. He has taken quite a liking to a stuffed teddy bear, spending much of his day snuggling with the toy. "He is just a show-stopper," said Carol Kelly, the executive director of the centre, in Spruce View, west of Innisfail. But even at his tender age, planning has begun for Charlie's career as an animal educator. The schedule for the celebrity porcupine is already getting busy, including a fundraising appearance this weekend (along with Otis the owl) at a Sylvan Lake bar. 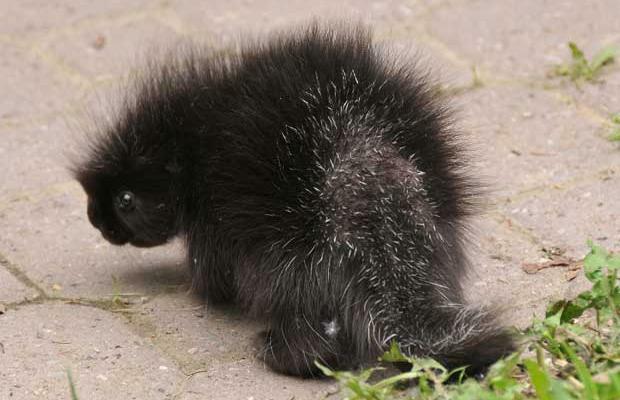 After he was brought to the centre, the porcupine was placed in an incubator and is now doing well, according to Kelly. The Medicine River Wildlife Centre houses roughly 150 animals, with about 50 of those in intensive care. The facility is a hospital for injured and orphaned wild animals, treating and returning them to their natural environment. But the centre also educates people about wildlife. And that's where Charlie will come in. Given the porcupine never saw his mother, he has bonded with humans, making him an ideal candidate to appear at schools to teach children about wildlife, Kelly said. wah! this is so cute! so fab! and i want a job there!!! Oh, wonderful. Love this story. Little Charlie. Kudos to the police officer and his wife. I adore this kind of story, so heartwarming! Look at that face, too cuuute! !